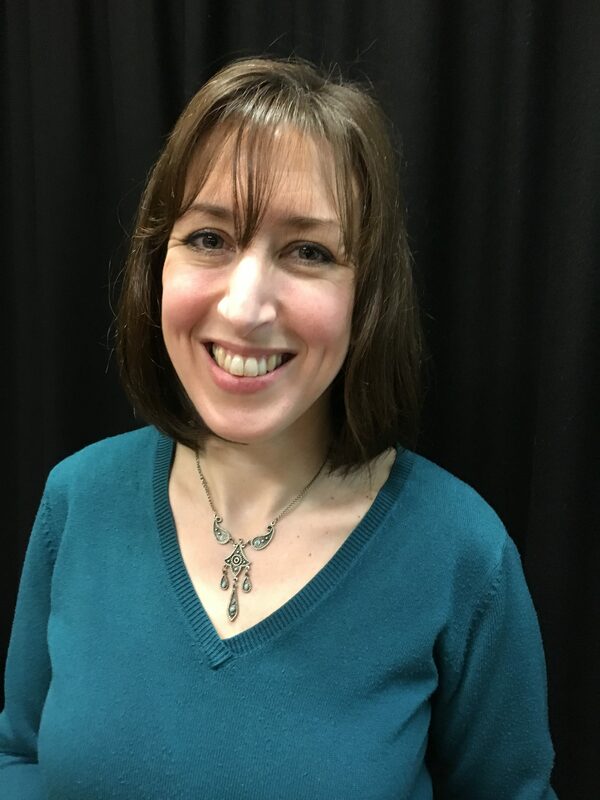 Following our AGM at the March 2019 meeting we were delighted to welcome Clare Durham introducing ‘Ceramics and Celebrity’, the Influence of Popular Culture on the Potting Industry. Clare is actively involved in several collecting groups and societies, both as a speaker and as a member of the English Ceramic Circle, the Oxford Ceramics Group and the French Porcelain Society. Clare began by explaining that influences on ceramics are contemporary to the time. In the 17th century the monarchy was the biggest influence on the aristocracy who were then the only collectors of fine porcelain. We were introduced to the first example of ‘celebrity’ which was the recognisable image of Charles I appearing on Delftware dated 1625-1649. She then showed a piece dating to the reign of Charles II 1660-1685 and a James II pot, which would have been dangerous to be seen to own following the King’s deposition as a Roman Catholic. The progression to the throne of William III and Mary II who ruled Britain jointly after James II was deposed in 1688 cemented the Protestant Cause and by the start of the 18th century there were a large number of examples of items showing William and Mary on porcelain. Celebrating the House of Hanover, German exported stoneware depicted George Royal (bearing marks GR) William Royal (WR) and Queen Anne (AR). By the mid-18th century popular foreign figures and the last titled King of Prussia were celebrated. There followed George III and Queen Charlotte, being shown on porcelain and as it became more affordable and mass produced, trade classes showed their support for King George during his illness by purchasing commemorative pieces. Returning to Charles II, we saw a fine example of a Jackfield teapot or silk glaze chocolate pot depicting the King hiding in the oak tree. Such hidden messages were used in of supporting renewed efforts to reinstate James Stewart during the 1688 Revolution. Military success was celebrated with naval conflict being depicted with subtle nods to George Brydges Rodney and later Lord Nelson and Lord Welby. and In classical war triumph, a bust of Wellington who was a source of national pride. Claire also showed examples of the venerated Napolean Bonaparte after the Treaty of Amiens of October 1801. However by 1803 there were also mugs mocking enemies being produced after the recommenced war over Russia. There followed examples of figures depicting prime ministers, elections, key politicians including foreign politicians such as George Washington and Benjamin Franklin. Clare pointed out that the two Staffordshire figures of Washington and Franklin have exactly the same features. The factory producing these figures had no idea what the individuals looked like at that time! By the 19th century, London Theatre was inspiring sculptures and as printing techniques developed famous actors were depicted in their roles on ceramic tiles. These popular tiles were affordable for the general public to purchase and in addition prints of John Liston were reproduced as figures in Pearl Ware, Derby, Rockingham and Staffordshire. Figures of female performers and actresses and singers such as Jenny Lind were also produced. In addition there are several representations of Billy Waters including a fine Derby example. More actors followed and as newspaper pictures improved in quality, so the precision in painting of porcelain improved. Eccentrics, preachers, famous individuals, abolitionists, evangelists all featured, as well as a quite grisly example of an infamous murderer. Figures of high profile animals too, such as Jumbo the Elephant from Barnum and Bailey Circus were made and we were also shown a transferware blue, featuring the Durham Ox dated 1802. Royal weddings, royal babies and Jubilees brought us back to 21st century production. And as Clare explained, commemorative ceramics are still produced and continue to be popular. Early Derby collectables are profitable today but the value of others is dependent upon the personality of the celebrity depicted. Clare brought her talk to an interesting conclusion by showing examples of Brexit mugs and Donald Trump! This entry was posted in Uncategorized on 10/04/2019 by HHCG Admin. 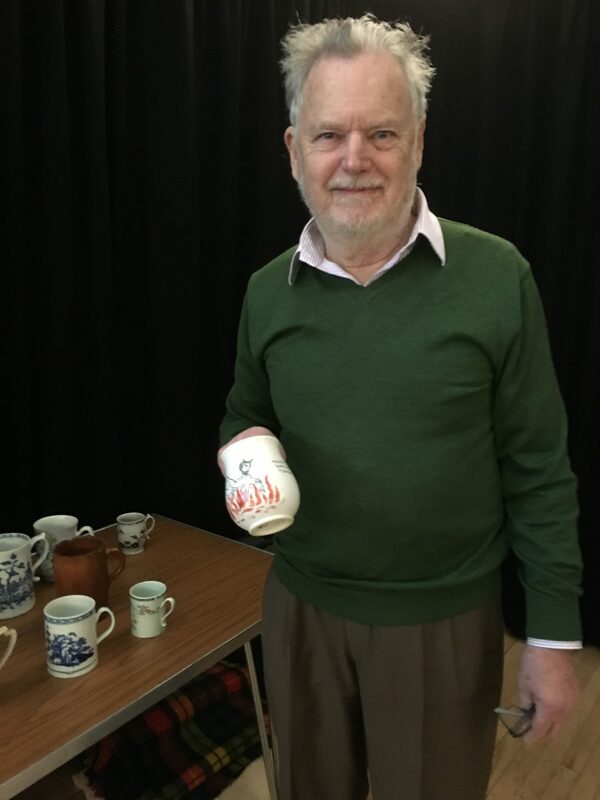 On Thursday 14th February 2019, the letter ‘L’ was the theme for Mike Turner’s entertaining and informative lecture called ‘A Mug Chasing Mugs’. Mike’s interest in collecting began some forty years ago when an elderly aunt shared her collecting passion and gave him a Queen Victoria commemorative mug. It has no particular value today and amusingly he discouraged anyone from collecting limited edition mugs as they are usually worthless! The collection now boasts over two hundred British mugs which predate the 1800’s. To bring the presentation together in keeping with the ‘L’ theme, Mike produced examples, including mugs from London, Lambeth, Liverpool, Longton Hall, Lowestoft, Laine Delft and more. All mugs are identified and dated, to within five years, based on information via word of mouth, from dealers, investigative writings or date marks. Chinese porcelain was imported in vast quantities by the East India Company and there are thousands of examples on the market now. One piece from Mike’s collection is a Chinese porcelain mug dated approximately 1740. It is painted in ‘famille rose’ style or peony colouring, which is characterised by decoration painted in opaque over glaze rose colours. The base of the handle on this example, shows a small reishi or Chinese heart shaped mushroom in relief. The reishi was believed to promote longevity. Mike went on to identify how the decorations developed, particularly the Chinese use of the peony, fence and rock – all of which have significance within Chinese culture. English Bow produced translucent, porcelain and the next example, dated 1755, was decorated in the Chinese style and includes the ‘mushroom’ at the base of the handle. A direct copy! By contrast, another piece dated 1740, was of London Redware which had been dug out of a well in Billingsgate in 1897 during road excavations. It is noteworthy as it is clearly dated and still retains its wax seal. London Redware was typically used for drinking vessels in public houses. The Liverpool factory produced the next example, made by Richard Chaffers and Company circa 1758, using clay or soap rock brought to Liverpool by ship from The Lizard in Cornwall. Another mug, made from clay drainpipe moulds was produced in Fulham. At that time it became clear that the average man wanted drinking vessels at reasonable cost. A quirk of this particular design was an ‘extra’ in the bottom. Inside these mugs, clay rabbits or frogs were fixed. These would be covered by the dark sludgy beer. After the beer was drunk, the air hole would clear and the animal would ‘spit’, thus surprising the unsuspecting drinker. In addition, Mike had brought more examples from his collection including Lowestoft blue and white, London Chelsea/Derby, William Reed, Longton Hall-William Littler, Worcester and Derby and Bianco sopre Bianco, Greek mythology depicted on Prattware and another particularly fine example of Creamware depicting Queen Charlotte. This is decorated in relief and specifically dated 8th September 1761, the date of her Coronation after her marriage to King George III. Of course, Mike could not fail to mention the “Turner Mugs” of 1795 which were made from Feldspar stoneware. Apparently, Spode bought the patent for Fedspar but went on to discontinue production as it was too long lasting and durable and therefore not profitable. Towards the end of the presentation Mike showed a very interesting example of a Liverpool mug dated 1790/91 which was emblazoned with the Bidston Hill signals – a system of flags functioning as a complicated semaphore early warning system for ships into Liverpool Harbour. At the conclusion of the lecture, members were invited to handle any of the items but were reminded not to pick anything up by the handle! This entry was posted in Uncategorized on 23/02/2019 by HHCG Admin.